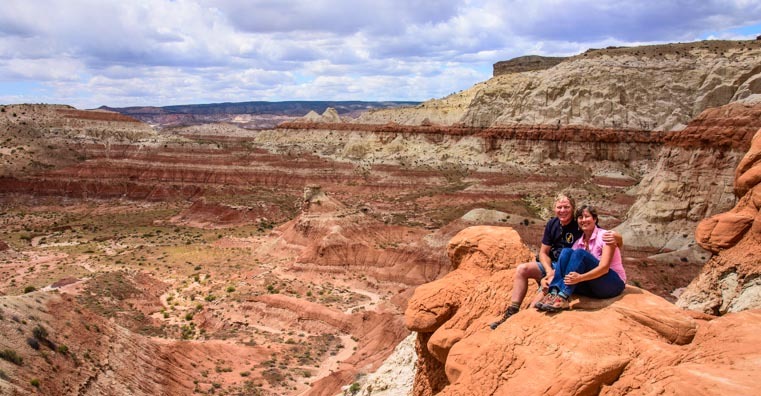 Paria Rimrocks “Toadstools” Hike to A Hidden Canyon! 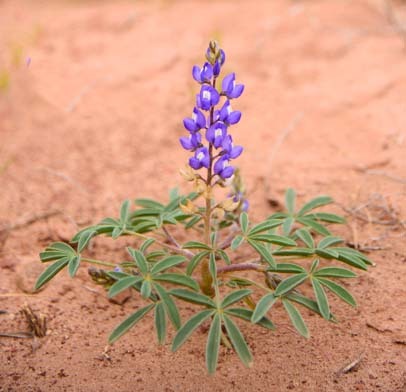 of wildflowers bursting with color! 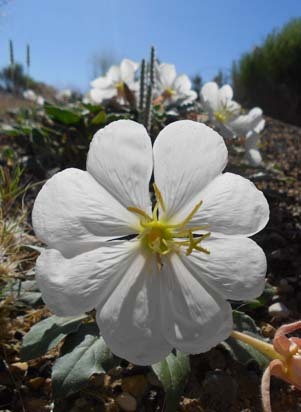 May, 2014 – All spring we had deliberately searched for wildflowers in Arizona, using the excellent book Wild Arizona as a guide. We had driven down crazy back roads and hiked into the hinterlands, stalking these colorful little beauties. We had found lots of pretty flowers scattered here and there, but the vast fields of color we’d hoped for never materialized. Another spray of color…so unexpected! That is, not until we got up to the Utah/Arizona border between Page and Kanab where we had actually come to hike slot canyons rather than hunt for wildflowers! Then, while out for a mountain bike ride, we came across a field that was a riot of color with yellow and white and lavender flowers dancing in the wind. Wow! We instantly dropped the bikes on the ground and got whatever photos we could with our pocket cameras. And then, our wildflower stalking began in earnest once again. We set our alarm clock and got up in the pre-dawn hours to catch these beauties at sunrise. Well, the joke was on us one more time. all four petals are shaped like hearts! We discovered that lots of wildflowers like to sleep in. 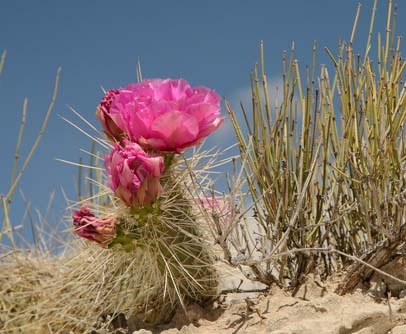 They don’t bother to open their petals until the sun is high in the sky, after they’ve have had their morning coffee! What’s worse, once the sun is flying that high, the wind picks up and the flowers begin to dance. Now, this is okay if you are just admiring the flowers from a distance. But if you are trying to capture their charming essence with a camera, this dancing business just becomes a blurry mess. Luckily, we had another excellent diversion on our hands. Hiking the Toadstools we find wildflowers and red rocks. Slamming on the brakes and backing up like crazy people, we discovered a hiking trailhead right there on the highway that turned out to be a really fun little jaunt. Amazingly, the entire hiking trail was awash in wildflowers. 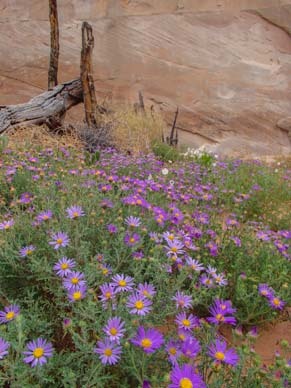 Every so often, as we hiked, the air would fall still and then the flowers would settle down. What luck! These guys were actually standing still for portraits!! 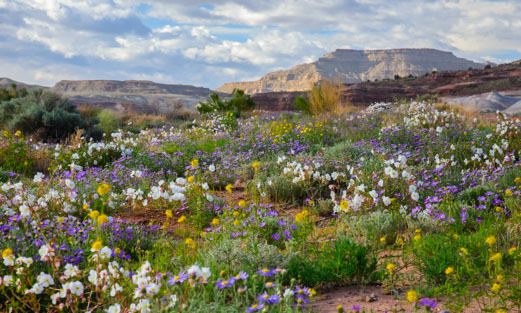 The Paria Rimrocks Toadstool trail follows a wash past pink and sugar white sand patches where the flowers were growing right out of the sand. 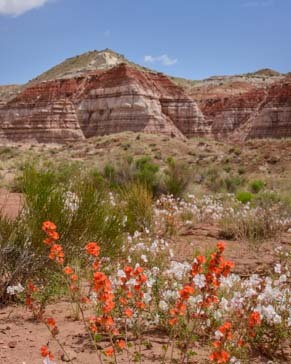 On either side of us, and in the distance ahead, rock cliffs rose up, each one horizontally striped in orange/pink and white. 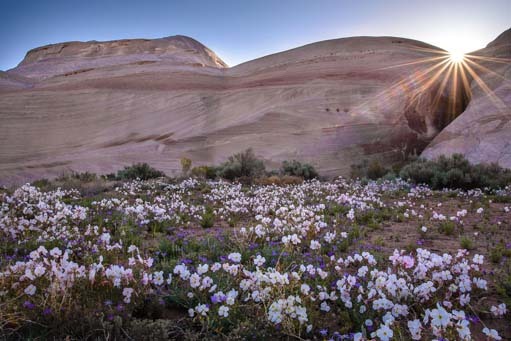 We were so focused on the flowers at our feet, though, that it was quite a surprise when we looked up and saw the Toadstool rock formations right in front of us. 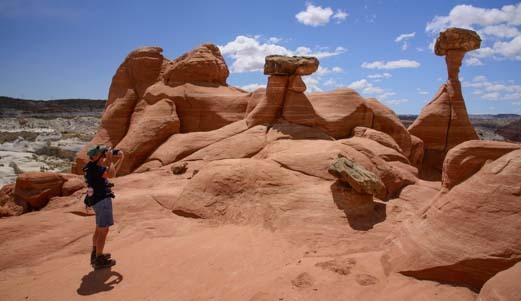 These odd rocks were reminiscent of the mysterious sandstone hoodoos we’d seen at Utah’s Goblin Valley where so many of the rocks resemble creatures. Some formations were also similar to the odd furniture-like hoodoos we saw at New Mexico’s Bisti Badlands. And, of course, Mark couldn’t resist trying his strength against one. Not a chance! These things are massively huge. This hike is all about white and orange sandstone in beautiful patterns. The little grouping of toadstools here stand on a wide platform that resembles a red rock stage. Going just a bit further into the wings of this “stage,” the ground suddenly fell away beneath our feet as we stood on a small rock outcropping. We stared in awe as a massive canyon filled with intricate red and white rock patterns took shape before us. How magnificent! You’ve gotta love Utah. A canyon that would be a national park in any other state doesn’t even warrant a mention in this hike’s official description! 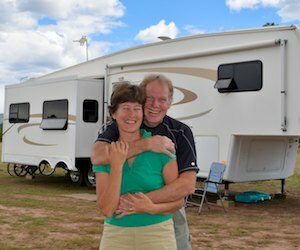 It is these unexpected little surprises — the discovery of a field of wildflowers, and bumping into a fun hike through “toadstools” to a red rock canyon — that make our roaming lifestyle so thrilling. 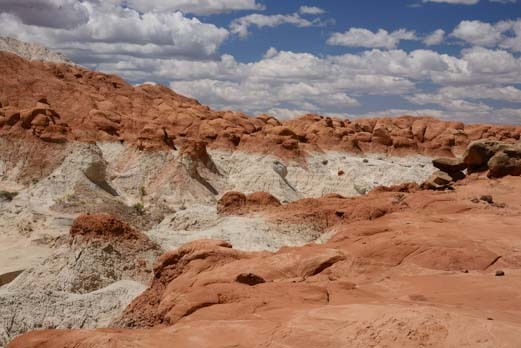 For more information about the Paria Rimrocks Toadstools hike, click here. This entry was posted in Utah and tagged Exotic Landscapes, Hiking Red Rocks, New, Travel, USA, Utah, Utah Southeast, Utah Southern, WP Travel by Roads Less Traveled. Bookmark the permalink.